Miami Beach 411 : Real Estate : Buildings (R-Z) : Santa Maria in Miami, FL. Santa Maria located at 1643 Brickell Ave. in Miami, FL 33129. Designed by architect Revuelta Vega Leon, Santa Maria is a 51-story high-rise that overlooks Biscayne Bay and downtown Miami. To find which residences are currently for sale and rent search the Miami MLS. 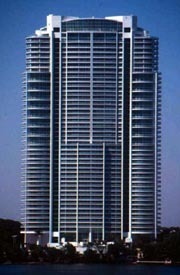 Developed by CMC Heartland Partners, the Santa Maria condo was completed in 1997. The 51-story, bayfront property has 2, 3, 4 & 5 bedrooms for sale. Prices start at $1,000,000. The condos have water views and range from 2,100 - 6,300 square feet. Square Footage: 2,100 - 6,300 sq. ft. The building's architect is Revuelta Vega Leon. The developer is CMC Heartland Partners. Comparable properties include Mark on Brickell, Jade, and the condos at Plaza on Brickell. Santa Maria is located at 1643 Brickell Ave. in Miami, FL 33129. Use our Miami real estate map to find the exact location.